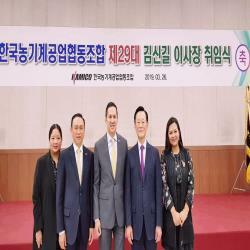 PH Ambassador to South Korea Raul S. Hernandez joined other dignitaries and diplomats at the inaugural ceremony of Mr. Shin Gil Kim as the 29th Chairman of the Korea Agriculture Machinery Industry Cooperative (KAMICO) on 26 March 2019 at the Korea Agricultural Machinery Global Center in Cheonan City, Chungnam province, South Korea. He was accompanied by Agriculture Attache Aleli Maghirang and Attache Jhoanna Jarasa. PH Ambassador to Korea Raul S. Hernandez (center) with the 29th KAMICO Chairman ShinGil Kim (2nd from right), Agriculture Attache Maria Alilia Maghirang (1st from right) and Attache Jhoanna Jarasa at the inaugural ceremony. In his congratulatory remarks, Ambassador Hernandez congratulated Chairman Kim on his successful re-election as the head of KAMICO, a prestigious organization of agricultural machinery manufacturers in Korea, and paid tribute to the close friendship and partnership between the Philippines and Korea, specifically in the field of agriculture through active collaboration between KAMICO, the Philippine Embassy, and the Department of Agriculture. Ambassador Hernandez also commended KAMICO for its invaluable assistance in the mechanization of the Philippines' agricultural sector through the sharing of Korea's agricultural technologies and expressed hope to further cement this partnership between the Philippine government and KAMICO soon through the establishment of the Korea AgriMachinery Processing Complex in the Philippines, with the generous support of Chairman Kim and CEOs from KAMICO's major companies. The Ambassador further expressed appreciation to KAMICO for selecting the Philippines as the venue of KAMICO's seminar for CEOs of member companies which was successfully held in Cebu and Bohol from 27 June-1 July 2018. 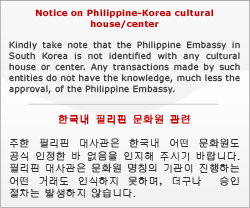 For his part, Chairman Kim acknowledged with appreciation the speech of Ambassador Hernandez calling him his brother and conveyed KAMICO's intent to pursue the establishment of the Korea AgriMachinery Processing Complex in the Philippines which he called "one of the promising export countries for Korea in Southeast Asia." Chairman Kim also expounded on the future plans of KAMICO, which include driving innovative growth in the 4th Industrial Revolution in the area of agricultural machineries; extending KAMICO's support for famous agricultural expositions overseas such as the AGRILINK FOOD LINK AQUALINK Exhibition to be held at the World Trade Center in Manila on 3 to 5 October 2019; establishing an Export Promotion Headquarters to provide customized support to KAMICO member companies seeking to expand their business overseas; and establishing agriculture machinery complexes abroad. Aside from the inaugural ceremony, Chairman Kim had a separate meeting with Ambassador Hernandez and other diplomats and hosted a luncheon for dignitaries and members of KAMICO. After the luncheon, Ambassador Hernandez and the PH delegation were provided a special tour of the Korea Agricultural Machinery Global Center which showcased the latest advances in Korean agricultural machineries.